Street Foods King of Booming Spicy Wraps! For anyone looking to get started in a street food business, Chris Rai from renowned & respected brand ‘Chapati Man’ takes us through his journey to success and offers some great & valuable advice for anyone contemplating starting their very own street food adventure..
StreetZine – You started your amazing street food business back in 2007, tell us a little bit about what were you doing prior to that and how you came to start your own food business? Chapati Man – Chapati Man was created by me and my wife, Andrea in 2007. The idea came from me taking left-over curry in a wrap to work. Our love of music festivals inspired us to share with other party-goers, the authentic curry recipes Chris grew up with; still being made by my mother Martha – and the Chapati Man brand was born! I had always been on the lookout for a business idea over the years. I used to take left over curry in a chapati to work and colleagues always used to comment on how good it looked and smelt – Chapati Man all developed from this. I’m not a qualified chef but my mother, Martha taught me how to cook quality curries from an early age, so I’m just passing on these booming delights to the masses! I was brought up eating chapatis for breakfast, lunch and dinner! Chapati Man was created whilst we were both in full-time employment (Chris a civil servant – I left after nine years service in April 2009 to fully concentrating on building Chapati Man; Andrea a textile designer – now a full time mother to our five year old son, Cassius – she is still heavily involved in business). SZ – Describe how long it took and what it was like to get your initial street food business idea up and running, from inception to your first day trading? CM – We first came up with the concept in early 2006 and launched in May 2007. We initially did tasters for family, friends (to pass onto their friends) and neighbours – this along with a questionnaire – the feedback was excellent and helped us make the decision to go for it – we invested in a new, purpose built trailer unit (a risk but you have to be a risk taker in any form of business!) and the rest is history. We used to go to music festivals as punters for years and spotted a niche in the market. We realised times where changing and festival goers wanted something different, authentic and with more quality to it than burgers and chips – festival organisers knew this too so saw Chapati Man as a breath of fresh air. The food was becoming just as important as the music. The Chapati Man mission was to give festival-goers the choice of a unique, tasty and healthy option! SZ – Tell us about your first day trading, did it run smooth, did you over or under-cater, how did it go and what did the punters say about your street food? CM – Our first event was Newbury Racecourse and is one me and Andrea will never forget. The first chapati we sold was a spicy daal (lentil) flavour – feedback all day from our customers was extremely positive and made us think we have something special here. SZ – What were the hardest things to overcome in your first year of street food trading? CM – Trying to work out stock levels for each different event and festival to be honest. It’s just all a matter of experiencing a particular event, so you have to take hits in the first couple of years of trading. I often get asked by new caterers how much stock I should be taking, how many am I expected to sell etc but it’s just about getting the first events under your belt and building up your experience to help you understand how you product works on a mass scale – experience and getting trading hours under your belt is key. 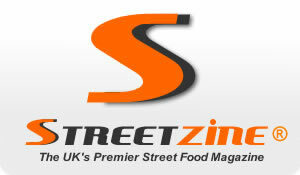 SZ – What’s the best piece of advice you would give someone who is thinking of starting a street food venture? CM – I’m contacted quite frequently by those looking to start out in the business. I am always more than happy to help and answer any questions they may have. The way to get into any festival or obtain a street food pitch is to offer something different and have a high quality product. Always keep your menu simple – Chapati Man has only ever had four curry fillings on our menu – festival goers/street food consumers want ease of choice not an endless list to choose from! Your unit/stand should be unique and pleasing to the eye. More importantly organisers are also looking at environmental impact in terms of how you package your product and how energy efficient is your set up. Chapati Man only uses one sheet of wrapping to package our wraps! We got into Glastonbury in our first year – we had something different and a quality looking unit, with a strong branding. SZ – Mobile catering has many highs coupled with many lows! What’s your worst and best ever experience in this industry? CM – We were voted No.1 food caterer at Glastonbury Festival by Virtual festivals in 2007 – an outstanding achievement in our first year of trading. Considering the Glastonbury weather in 2007: endless rain and knee high mud! It really helped us believe that Chapati Man had a long term future in the catering game. It also made me and Andrea think that we had a business/brand/product here, which could really go places. Chapati Man’s chicken saag wrap, with fresh mint chutney and a cachumber salad won the National category at the British Sandwich Designer of the Year Finals 2011. A great achievement and something me and Andrea are extremely proud of. A great boost for the Chapati Man brand too. SZ – Originality is much more difficult nowadays with so many traders on the scene, what advice would you give regarding planning a street food menu for a new trader. CM – Keep the menu simple! SZ – You’ve clearly worked extremely hard at developing your street food brand, testament to this is having your products stocked by major retailers. Can you give our readers any advice on how to approach this market? CM – This is a very challenging area to get into and to be noticed. Obtaining meetings with buyers is difficult, getting a listing is even more difficult and then keeping your products/brand on the shelves is an even greater challenge. With the success of the festival business and the creation of the Chapati Man brand, me and Andrea really thought we could see the brand and concept sitting on a retailer’s shelf – not an easy thing to do but in early 2008 we started exploring these opportunities. The retail part of the business began in March 2009, with Chapati Man Ltd making its retail debut with a national supply deal with Morrisons. Morrisons believed the Chapati Man brand had the necessary brand authenticity and recipes to plug a gap in the retail snacks market. Chapati Man traded in Morrisons for over two years, with the brand, building a loyal customer base even in a difficult trading climate, something Chris and Andrea are rightly proud of. Our new range of food-to-go Indian snacks were launched into Waitrose stores in September 2013 (largest food-to-go and convenience stores). They launched with three of our snacking products: Large Chicken Tikka Samosa, Bhaji Selection + Mango Chutney snack pack and our Aloo Tikkis + Tomato Dip snack pack. A huge coup for Chapati Man, as Waitrose’ food-to-go fixture is predominantly own label, so to obtain this listing was a huge achievement. SZ – If you could go back in time and start again, would you do anything differently? CM – Never look back, always look forward! SZ – The very nature of good quality street food requires a lot of preparation and often contain many different ingredients, what makes your food products profitable and able to achieve high output at large events / festivals? CM – All types of quality catering involves plenty of prepping time but that is the nature of the game. The curry spices we use for example are not expensive ingredients but they have to be used with care to make a wonderful, authentic tasting curry filling. SZ – What types of street food do you feel wouldn’t be suitable for high output at high pitch cost festivals, like Glastonbury for instance? CM – At the end of the day at Glastonbury for example you are aiming to feed the masses, so your product has to be able to cope in meeting this demand. If your product is fully bespoke and you can’t keep up with demand you are not going to make any money. New mobile caterers should always think ‘retail’ – you are there to make money after all. SZ – Where do you see Chapati Man in 5 years from now? Any exciting news or plans on the horizon? CM – We are always looking at ways/ideas on how we can move forward – the whole nature of business is to keep moving forward and don’t stand still. There is plenty going on but I can’t reveal it just yet. So, fingers crossed! Onwards, upwards and boom!